Do you ever have a hard time trying to keep your audience awake and engaged at your event? It can be challenging, indeed. But there’s an easy way to put your mind at ease. If your guests are already sunken into their phone screens…use it for your advantage! Everyone—from wedding planners to corporate event planners—has started to use social media walls to provide their attendees an awesome way to interact at their events. There certainly is a huge opportunity to engage event guest through the social apps they’re already using. By adding a layer of interactive participation, social walls give every attendee a chance to see their posts on a massive scale, creating conversation out of social sharing—and they sure love the attention. Twitter, Instagram and now social walls have exploded in popularity at events in the past five years. Not only have social walls been seen at more and more events, but also at a wider range of events. 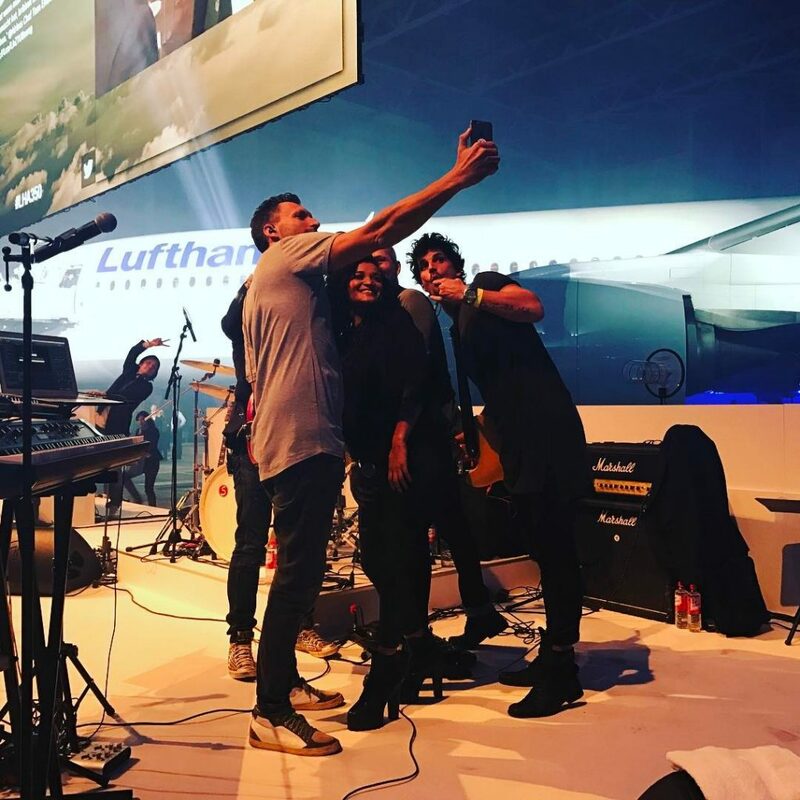 From concerts, to conferences, to parties, to trade shows, social media walls are the new way to engage with your attendees, tickle their thoughts, spark discussions, and all and all, amaze your event. With such different atmospheres, audiences and needs—not to mention hairstyles! —how can it be that a rock music festival and a real state conference both look for, use, and enjoy a social wall at their event? There certainly are numerous benefits from engaging with your attendees through a social wall. Here at Hashslider, these happen to be some of the features that make our clients to fall in love with the app. Configure your event. Keep track of what your guests are doing by adding a unique, concise and memorable #hashtag—or hashtags, if you will—. You can collect your attendees-created content from either Twitter, Instagram or both by clicking on the app’s logo. You can even select a starting date, meaning a day when the first post shown on your slide was uploaded. Moderate content. Nobody wants bad reviews or inappropriate photos displayed in a giant screen at their event. Hashslider’s controller view allows you to select the photos, videos and/or tweets that will be shown on your slideshow, or ditch the not-so-good posts by simply clicking on the BAN button. You can also control the speed, the effect, and many other tools to customize your slideshow to your liking. Set your screen. If you want more than one people to control your slideshow, or you simply want as much accessibility as possible, now you can. Use as many devices as you want to moderate the content of your screen. All you have to do is log in to the application and open the My Events Page, from where you’ll have access to the controller view of all your events. Are you loving us so far? This is only a sneak peek of the many features Hashslider offers to have a highly satisfactory experience. And with our newest version, it has only gotten better. No wonder why a mohawk hairstyled rocker and a sleek hairdo real estate agent can both enjoy Hashslider. And not only that, but social walls like Hashslider can be used in so many different ways! Care to learn how? Keep reading. After reading this far, I’m sure you at least know the basics of a social wall: how it works, its benefits and the best option in the market—hey, we are! 😉 –. But there is so much more to a social wall than just displaying photos and tweets. There are many different and creative ways to use it and ultimately engage with your audience, which is all you really want. 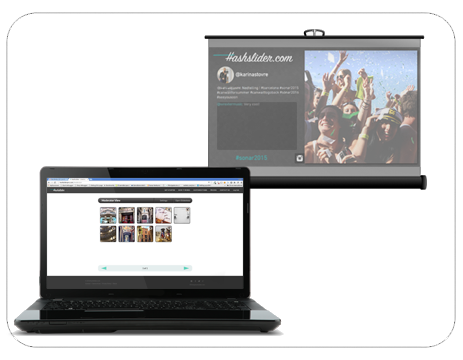 Here, we would like to share some ideas on how to use a social media wall—read as Hashslider—for your upcoming event. Display user-generated content. 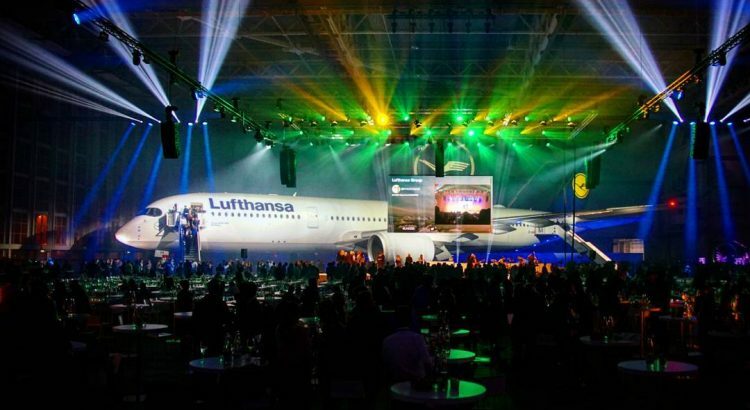 The most popular way to use social media walls at events. The good old—not old, but you know what we mean—photo and tweet streaming via hashtag. Your attendees will have the chance to contribute with their content and have their 15 seconds of fame on the big screen. A simple and effortless way to use your social wall. Display sponsor’s content. You could offer your sponsors their own screen at your event. Or if that’s a little too much, maybe special time on your wall. A great way to partner with some brands, while providing you audience an insight to what your sponsors share/talk about your event! Display speakers content. Have some great speakers lined up for your conference? Share their best quotes, tips and ideas via Twitter. That way neither you nor your audience will miss anything of they what they are so wisely sharing! Your speakers will be grateful, too, for they might even gain some followers themselves. Run a social Q&A wall. Instead of doing it the archaic way—asking people to stand up, having them wait until a nervous man runs to hand them a mic, and then listen to them babbling their question—tell them to tweet their question with your hashtag. Pick some of your favorite questions and have them displayed on the screen. That way, your question and answer session can be a lot easier and much more effective! Organize a contest. During your even you can also use your social media wall to host a contest. Entertain and engage your guests with some fun! Whether it is a funny selfie challenge on Instagram or a clever rime contest on Twitter, this can be a great break from more serious lectures. Don’t forget to choose a prize that matches your attendees’ interests! Now your attendees constantly being on their smartphones won’t bother you anymore! Go beyond social media and add more to the onsite experience. Live social media displays like Hashslider are being utilized more and more at events. Innovate your dynamics and try new ways to incorporate this audience-engaging tool with you own unique touch to guarantee your guests a better even experience!